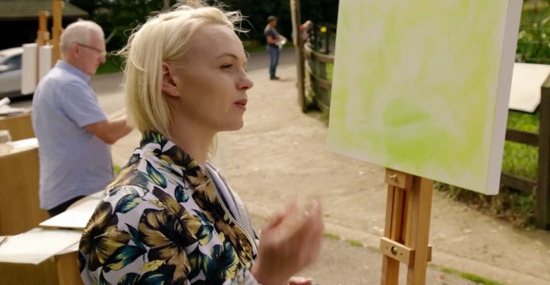 Episode 3 of the The Big Painting Challenge was painting animal antics and they were at Whipsnade Zoo. They seemed to enjoy a bit of sun in contrast to the previous four seasons in one day experience of Hastings! As always, the first challenge was two hours. The aim was to capture a flamingo on canvas. Obviously, the notion that the media used was the artist's choice (from the first week) has gone out the window and we're back to oils and acrylics. It's all too easy to use cliches, but to actually look at a flamingo and turn that into a convincing painting, that's very difficult indeed. As if we all walk around with cliche caricatures of flamingos in our heads all the time? It began to make sense when the cliche/caricature theme kept coming up throughout the programme. I came to the conclusion he was just parroting a pre-agreed theme rather than telling us his own thoughts. The other really irritating nonsensical comment he made was during the judging. Obviously he's fixated with criteria and has never seen a portrait which portrays somebody dead from the neck up. It's NOT the genre of portraiture that gives the spark of life, it's an artist's talent, skill and experience! So far I'm totally at a loss as to why he's a judge of a challenge/competition like this which basically focuses on the development of basic painting skills by amateur artists. While he does make some intelligent comments, he frequently comes up with comments about the paintings which are completely at odds with the other judges who are actual professional artists. I back Daphne and Lachlan - I know them both personally and, although they won't always agree with one another on everything, they are both practising artists and both know what they are talking about! By way of contrast, I looked up David Dibosa's CV again and there's not a jot of practical experience as an artist in it. He's an academic, an art historian and a curator and while I might be very happy with him taking up the cudgels with Andrew Graham Dixon, I really don't see what he has to add to this programme for amateur artists - apart from possibly meeting the BBC's diversity challenge. This interview with him summed up to me why he is so wrong for this programme - he simply hasn't got a clue about amateur artists or what sort of messages they need to hear! Was it tough being a judge? It was more serious than I expected it to be. I thought it would be more light-hearted but the contestants were so passionate about their art that it varied from shock and surprise when they got through to distraught contestants in tears when they didn’t. Would you like to do more TV judging? Yes! It’s fascinating to see amateur artists progress at that speed. It would be a pleasure to do something similar. I also loved the glamour and being made a fuss of – it’s a luxury having someone always checking you’re looking your best! However, I come back to the query I raised last week as to why does this programme need SEVEN people other than the participant artists on screen? I want to see people included because of their practical ability to add real value to the intended audience - not because of the colour of their skin. That means they must know and understand that audience. It also does a huge disservice to the very many talented artists out there who can articulate a critical and valuable judgement based on masses of practical PAINTING experience AND 'represent' some aspect of our diverse culture. If there's a third series, in my opinion David Dibosa needs to be replaced by somebody who actually paints/teaches for a living. Artists were urged by their mentors to put some effort into their observation and, very sensibly, there was much use of sketchbooks next to the fence at the beginning. What I didn't quite understand is why, when they started to paint, they appeared to be some way further back from the fence and away from the flamingos. I know they move around but I'd have wanted to be as close to them as possible. Then I noticed that they all seemed to be blessed with a very unusual item of equipment - a brand new and rather big studio taboret - not often seen when artists go plein air painting!!! A palette and lots of kit on a nice flat surface - wouldn't it be nice if all plein air painting were so easy? What on earth is going on? 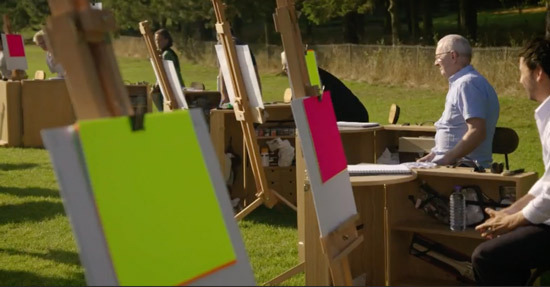 Did the BBC watch the programmes about Hockney painting the Wolds and this is now "pretend you're David Hockney and have a studio assistant who gets your studio set-up out of the back of the studio vehicle and sets you up with a nice flat surface for mixing paints"? I say bring back Watercolour Challenge - we didn't have any of this studio easels and taboret nonsense in that! Proper plein air easels and the normal small folding table were all that was needed to produce largish paintings! I'm actually beginning to warm, just a little bit, to Pascal. He seems to understand what's holding some of the painters back. He made an astute comment about Camilla tending to ignore things she doesn't like confronting. Mind you there was one point in this particular session when I began to wonder if any pinks, corals or oranges were going to get on the canvas of ANY of the artists. I've never seen quite so many people spending forever on their green underpainting and backgrounds! I'm beginning to characterise David as "the grumpy one". He moans a lot and doesn't seem to be very happy with any challenge. He also has a new strategy of working out "how to please the judges" - and went for a minimalist palette in the first painting. I'm not sure he actually wants to improve. Diana commented that Jennifer needs to think more about observation, her definition is missing. They've made this point every week so far to little practical effect. For me it made Daphne's comments during the judging of the first session to be completely logical. I keep wishing Alan would actually fill a whole canvas. However, he didn't tell them what to do when looking! I don't know whether it ended up on the editing room floor but I always make a point of drawing with my eyes when I'm looking - my eyes follow each line I want to draw so I've already practiced it for when I actually draw. Looking without analysing and drawing in your head makes no sense to me. I remember drawing an elephant once in Bali and they're not easy - so the artists had my sympathies. NOT A normal plein air set-up! Whoever did the set-up for the placement of artists relative to elephants forgot to think about where the sun would be. It was painful to watch the artists squinting to see and sketch the elephants before they started painting. On the other hand, backlighting (such as strong sun can provide) does give you wonderful silhouettes which provide a better understanding how the whole works without the distraction of the detail. A number of the artists didn't really get the colours of the elephants right. (Maybe because colour wasn't one of the criteria?) I don't see any testing on a separate sheet of the colours they need to use. Some seem to be following the dab a bit, mix a bit and pray approach to mixing colours. I loved some of the paintings near the beginning and found them totally overworked towards the end. A skilled artist can make good use of six hours. An artist who is still learning and needs to develop could do with a shorter time frame to avoid ruining their painting! The public panel was made up of staff who look after the animals and hence the people who were in the best position to tell who had really observed and captured the elephants best. I wasn't in the least bit surprised that Suman Kaur won - her paintings was by far the most accomplished. Although even I quite liked what Jennifer produced this week. I'm fine with their explanation as I guess most other people will be. If you set up a programme with the aim of showing people going on a journey then you actually need to see some active listening and demonstration of an attitude of being willing to try new things and going forward, you want people who are going to change and develop. If you listen to your mentor so as to "please the judges" you'll soon find out that the judges don't always agree with the mentor! Some of the paintings this week were horribly overworked in some areas and underworked in others. The hardest lesson for any artist to learn is when to stop. If you've finished - and you've had a break come back taken another look and still think it's finished then you can walk away. Just because somebody gives you six hours does not mean you have to use the whole six hours. If you're just going to paint the subject animal just do that and stop. Remember Whistlejacket? Plein air painting for real is nothing like it looks on the BBC. Really! Judgement is aided by practical experience of and expertise in the matter of which you speak. I think I'm beginning to yearn to see a jolly good tutor taking a well-motivated group of amateur artists on a painting holiday and seeing the lessons day by day. More an emphasis on who has the most pleasing portfolio at the end of a week's painting. My experience suggests that most people have good days and bad days. They have some subjects which suit them and some that don't. Most people can produce some good paintings. Some people can produce a lot. It's much fairer to judge people in the round - and to forget about knock-out competitions! The next episode is about Portraiture and the artists will be at the National Portrait Gallery. I suspect the first challenge will be about painting dancers and the second will be a formal portrait of Angela Rippon. In terms of who goes next, I think it will be either David or Jimmy. Jimmy's not getting a lot of screen time which makes me think he disappears earlier rather than later. I think Suman and Jennifer are in it for the long haul and possibly Angela. Reference: Another blogger commenting on last week's programme is Is the BBC biased | The Big Painting Challenge. 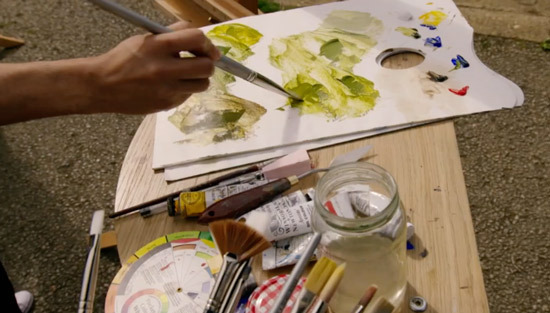 The NEW BBC Painting Show - which outlines the process for entering. For those who want to revisit the 2015 Big Painting Challenge you can find all my past blog posts still available - and listed below! So what did you think of The Big Painting Challenge? PLUS my blog post about the run-up to the new show in 2017 in The NEW BBC Painting Show - which outlines the process for entering. This was the episode which caused me the greatest doubt that I'll stick with the programme. I was amazed, given the time they had (and you're right, if they had been given less time they might have avoided the obvious trap of ruining any good work they'd managed to do) at the appalling quality of their basic drawing - even given elephants are difficult to paint, the drawing was all wrong to start with: you can't produce a good painting from a rotten drawing; and let's pass charitably over the flamingos, although pink turkeys is what came to mind. These people, on the whole, lack all the basic skills you need - either they faff around with achieving texture, or their paintings are as flat as a desert plateau, but in none of them does it look as if they've been taught to draw, still less that they've managed to pick it up for themselves. I wonder if the truth is that better artists than these just don't apply to take part in programmes like that - that the desire to be on a television competition eclipses all self-knowledge, and that it's the lack of self-knowledge that's the trouble... Frankly, you'd have got better paintings if you'd just given the brushes and paints to the elephants. Katherine you are right on the button with this programme. Especially the long distance placing of ‘studio’ easels and set ups. And all in one group! Your points are very accurate. In fact I think the programme is about teaching rather than learning! And these teachers need to learn a few things! Sometimes it seems they are making a criticism for the sake of it and not offering some well needed advice. My advice to anyone thinking they would like to be in this type of competition - really check out the terms first and if you are going to be working en plein air, then go out and practice. Thanks for your input. I look forward to reading your comments and advice every week. David Dibosa has been far to keen simply to offer praise. It's hard to believe someone of his calibre could be so blind to fundamental problems in paintings if presented with them in another context. It's a shame because his statements end up lacking credibility. I like Pascal. He was very diplomatic with Camilla. I think your choice of the word ridiculous in describing part of the show fits as good overall summation of the series, which seems preposterous compared to last year. It's really hard to fathom why they'd take very inexperienced beginner artists and give them painting challenges consisting of mostly unattractive, uninspiring and/or incredibly difficult moving distant subjects to paint. Also, one Plein air painting worked on for 6 hours with a focus on light? In the US after 2 hours the sun has moved enough the shadows have changed, let alone 6 hours where they'd be on the other side. Is that not true in England? I actually look forward to reading your blog after the episode Katherine and eagerly await its release after the each show. I think it's mostly because o come from the perspective of having been there behind the scenes do to speak. Something I observed when filming during episode one was how much everything was set up for the cameras in order to produce good TV. They have an awful log of equipment and crew with jibs and all sort so it almost seemed as though the contestants were secondary to all this. We were placed in quite specific areas because it was better for the cameramen. 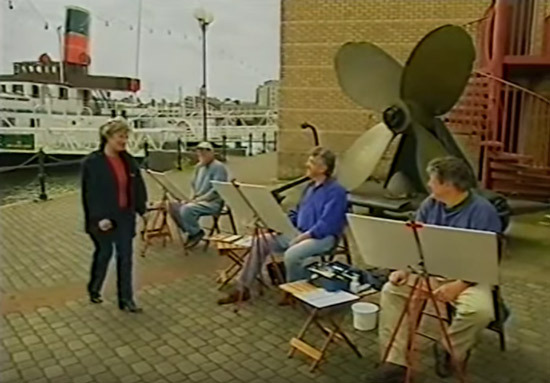 This was a huge issue when we were painting Pam St Clement for example because she was so far away from us and so pooorly lit it was almost unrealistic and highly unlikely and artist would use a similar set up in their own studios. So to me this would explain the placing of the taborets which incidentally you will have first seen when we painted Blenheim a Palace. To me there's just an awful lot of poor location selection in terms of what an artist's needs will be as well as the technical filming considerations. I must remember to elaborate next time on how I was once on the receiving end of a television crew filming a segment for one of the BBC Holiday Programmes - so I know how many people you really need to produce a decent filming experience - and it's a producer, a sound man, a cameraman, a techie person who keeps track of everything and a presenter - because that's how much we had - and I've even got photos of them. Must dig them out! My biggest gripe with this programme is when the mentors don't listen to the artists. There is a big difference between opening people up to different approaches and out and out telling them specifically what to do. One of the only times i've seen the advice work for the good is Suman's elephant. The advice to use a big canvas to free your expression seemed good and did not tie her up in knots with specifics. Contrast this with David, all the advice he has had has totally disregarded his skill and natural ways of expression. It has been more about the mentors imposing their own preconceptions inappropriately. I would not consider Jennifer Morrow as an amateur painter as the others in this group. She has a first class degree in Fine Art from the University of Belfast plus a couple of residencies. This is one of the residencies she attended: http://surfacearts.co.uk/jennifer-morrow/. To be honest, she is incredibly annoying. I am actually enjoying the mentor of Pascal. "I think I'm beginning to yearn to see a jolly good tutor taking a well-motivated group of amateur artists on a painting holiday and seeing the lessons day by day." I'd watch this. In addition to filming them painting they could record some group dinner conversations talking about the process and challenges of the day's work. It would be much more natural and engaging. And instead of the standard backstories, we could hear the painters talking about their work. If they wanted a judging element they could bring them in at the episode to discuss and critique each artist's work produced during the week. Call the BBC!